Hi, As far as i can see theres a list of Paragraph Styles i can Chose from, and i also can produce new ones..
Well when dealing with larger Documents , i can imagine, you can get lot´s of Styles here... Can i organise my Styles in folders somehow ? this would be very handy. and also a Question, are these Styles available only in the current document , and if not, can i save them ore store them alswhere, ore can i import them from other documentes ? are these Styles available only in the current document , and if not, can i save them ore store them alswhere, ore can i import them from other documentes ? You can't export styles at the moment but you can import them from other Publisher documents. Whether you store them separately or them being part of a Template document is immaterial in my view. A file is a file is a file. The way styles work in Publisher is a bit different. You don't have folders but you can organise them hierarchically by basing one style on another. You can also check the burger menu next to the Styles Heading and check Show Hierarchical. That might go some way of alleviating that issue. Well also get Confused with the pannels organisation... look at the screenshot.. for example in the textstyles pannel i also create paragraph styles ? Why , wouldnt search here..
i have to admit, i am not at all experienced with textlayout.. but how does all this work together ? and when i make my own Style, how can i organise it ? Tom, the Paragraph panel contains paragraph formatting for the current selection. That formatting may have come from a style, or it might have been changed locally for the text. It's useful to see what is going on with the text, and for people who aren't using text styles. The Text Styles panel contains everything about text styles. You can create new styles here by clicking on one of the first three icons at the bottom of the panel. To create a folder for styles, use the third icon to make a Group style and then base other styles on it. Also switch on Show Hierarchical to have the nesting shown in the Styles panel; groups get flattened by default. You can edit styles directly by double-clicking on them in the Text Styles panel, or by using the menu to the right of each style. Dave, can existing styles be add to a style group? ill try this out later on.. maybe we will see soon anoter of your great Videotutorials, how to deal with this ? Of course only if you are not planing to change major funktions here. By the way, if in the "TextStyles" Pannel you also change all other Sorts of Styles, You realy should change the name from "Textstyle" To "Styles"
Yes, by changing their Based on field. Styles inherit formatting from the styles they are based on, so you may want to include formatting in group styles. Show Hierarchical simply reflects the Based on field, so you may have some useful organisation already. You can add an existing style to a group by editing the particular style and set it's 'Based on' property to the group style. I think we have to try and see how dependencies work then. PS: Dave beat me by a minute. i am not quite sure, this is a better aproach as indesigns folderstructure. But it should work.. I'm not certain that is a good approach, but I'll need time to play with it. It would seem one would need truly good, well thought out organization upfront. That's not how some/many/most publications grow...especially grow unwieldy as regards text styles. Seems simple folders that one can drag styles into, or have that folder open and create a style within it, is simpler But hey, my comments are based upon ignorance at this point. So this is what 'Group Style' means. What is the purpose of this over the 'Based on' setting also described by others above? For very good reasons, the main styles might want to be organised in one folder an the Appendix styles in another even though the Appendix Body style might be based on the Main Body. Does that make sense? Maybe this is what Group styles do and I have just haven't understood correctly? yes i am courious about that to.. why not folders.. even when groups are not sobad ! maybe a further switch would be aprecciated ? make also your own folder for organising, and switch if wished to your grouping layout... to better see the dependencies ! What is the purpose of this over the 'Based on' setting also described by others above? Well, Based on means that the style you want to create is more specific. Example: Body Text. This style is applied to the majority of your text. But there are places in your document that require space after in your paragraphs. So you define this new style based on Body Text except that you need to add space after, say 6pts to your new style. You don't need to create this new style with all the information that comes from your Body Text again. Basically you derive all that information and add some more. You specialise it. Styles work from General to more specific. Styles above the hierarchy are more general, because they contain the majority of the styling information you need. Thanks, but I do understand the basic principle of ‘based on’ and it is very helpful. The question was what and how this differs from a ‘group style’. Anyone know? OK. Group Style would be in charge of holding information that pertains to a number of styles. For example you have a number of Text styles that need to have common information. In this case you would want to create a group to host that information there. Titles, subtitles, headings may need to have something in common so you group them in Headings Group to keep all that commonality there. But deriving really means specialising one style directly from a style one above the hierarchy. But isn’t that exactly what the ‘based on’ feature achieves? I just can’t see how or why having both would be desirable. I can only see situations where it is unclear whether a particular style setting is being derived from the group style or from the ‘based on’ style. Indeed, in hierarchical view, they appear much the same. Having one or other of Group styles or Based on feature and a folder structure would give a lot of flexibility. Currently it appears to just be confusing. I just can’t see how or why having both would be desirable. You still need to derive either from the group or from a style above. I think about it as a tool to organise my styles and commonalities within my style hierarchy. Other people may elect to completely ignore that feature and that's absolutely fine too. You have options there. If it doesn't fit your needs organise your styles the way you want. As Dave said, all styles are flattened anyway. As a newbie I am confused by this. I understand a “based-on “ group, but I would like the possibility for a group or folder to have a set of styles for one document or document portion. I want to locate and use them easily, without searching them out in a long list of everything. The long list of all styles is just confusing. Interested in the way to create a set of personally created styles for a particular use. That is, “Mary's stuff” for a shared computer, or my “long book” as opposed to a subset for “magazine article” or “poetry book” or “newsletter,” as well as the separate uses within a long document such as Robinp proposed. Perhaps what I am thinking of is more of a template option—- If I open my “long book” document, I get just the styles I have created for that document (with the possibility of editing or adding to these), or if I am in the Appendix, I can isolate the styles for Appendix. Maybe I am missing something. Is there already an option to open a document with the set of styles I have previously created? Or can I bunch the styles I am using in the current document at the top of the list with all the unused stuff below? Or something in Studio to open a list of my named subsets of styles? Or maybe a palette like the Resource manager showing just the styles used for that particular document for quick selection? Hi, I think currently there is no way to create template documents other than manually managing them yourself. Ie, there is nothing stopping you using a particular file as a template. I haven’t done it yet in Publisher but I understand it is possible to import styles from one document into another. In this way, you could have a template or series of template files set up which have the styles required for different types of documents and then either duplicate / save as or create a new file and import the styles. 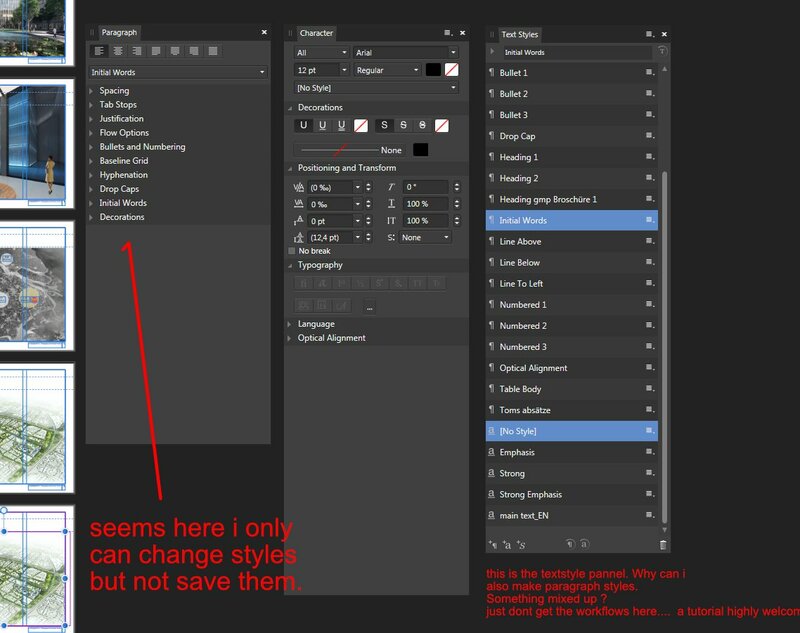 As for a more flexible way of organising styles, I think there is currently no way to do this. The best idea so far is to have folders so you can drag and drop styles into folders as required. I’m sorry but I don’t buy the ‘more options are better’ argument it is just bad design to have two features that essentially do the same thing. Doing so makes it confusing because the app is more cluttered. It also makes it more difficult for different people to pick up working on a document that another person has worked on. It’s all very well being in your own bubble but it is essential that it is as easy as possible for someone to open a document and immediately get to work on the the file. If there are different ways of achieving essentially the same thing, it is going to make it challenging. I don’t mind which it is, and unless someone can provide a compelling use case for having them both, we should have either ‘based on ‘ or ‘group styles’. Folders on the other hand would be very handy. Perhaps even better would be tags so that you could sort / search them as required on the fly. Thanks, Robinp. Folders could do it. They will certainly be a help.